In quest for quality and sustainable development, it is necessary to find alternative materials, methods of brick making and house design. Bricks made in open kilns using locally available materials usually do not meet the requirements of the South African Bureau of Standards; hence it needs to add some ingredients such as fly ash to produce better quality bricks. This paper reports the effects of fly ash on properties of clay bricks that can improve the thermal performance of buildings. Bricks of different clay and fly ash mixing proportions were molded. A passive solar house was designed and constructed using fly ash bricks. Results indicate that thermal conductivity and water absorption decrease with increase in fly ash. Compressive strength was found to increases with increase in amount of fly ash. A mixing proportion of 50% of fly ash to 50% clay by volume produced a brick with the highest compressive strength, lowest thermal conductivity and minimum water absorption. The bricks were observed to have uniform size as they experience minimal burning shrinkage. These properties were found to have a significant impact on the thermal performance of the house. The mean indoor temperature swing was found to be 11˚C. In spite of being cheap, the locally made bricks possess some grave disadvantages, i.e. high water absorption, great shrinkage, high thermal conductivity, low compressive strength and non-uniformity in size and shape. The aim is to decrease these disadvantageous characteristics. Simple intervention such as north orientation (in the southern hemisphere) of the house and placement of bigger windows on the north wall plays a crucial role in creating a more comfortable indoor environment  . Raw materials used and the firing temperature influence the brick properties. The South Africa Building Standard (SABS) recommends a minimum compressive strength of 5 Mpa and a thermal conductivity less than 0.69 W/km  . It is desirable to add some more ingredients to produce bricks of good quality. Fly ash is one such material that can improve brick quality  . Bricks with low thermal conductivity, low water absorption, high compressive strength and high sound damping are most preferable. This paper investigates the effects of fly ash on brick properties and the thermal comfort of a passive solar fly ash brick house. The burning of harder, older anthracite and bituminous coal typically produces Class F fly ash. Fly ash produced from the burning of younger lignite or sub-bituminous coal, also has some self-cementing properties. In the presence of water, Class C fly ash will harden and gain strength over time. Class C fly ash generally contains more than 20% lime (CaO)  . Brick properties are affected by composition of the raw materials and the manufacturing processes  . For the production of bricks raw materials must possess some specific properties and characteristics. Clays must have plasticity, which permits them to be shaped or moulded when mixed with water; and they must have sufficient wet and air-dried tensile strength to maintain their shape after forming  . The properties that determine brick quality include the following: durability, colour, texture, size variation, compressive strength, water absorption, thermal conductivity and sound damping. High thermal conductive bricks result in houses with high temperature swings with rapid response to the outdoor temperature variations while bricks with less sound damping results in house with poor privacy. The addition of fly ash to clay can significantly improve brick properties. The chemical composition and the energy content of the fly ash determine these properties. The chemical and physical properties of fly ash depend upon many parameters such as coal quality, type of coal pulverization and combustion process followed nature of ash collection and disposal technique adopted, etc.  .
A mesh sieve was used to separate the unburnt coal from the fine ash; the mesh sieve was inclined at an angle of about 60 degrees and supported by two iron rods. The fly ash was first dried by heating to a temperature of about 80˚C. The fine ash was used to mould bricks and the incomplete burned coal (coarse fly ash) was used to burn the bricks. Bricks of size 230 mm × 67 mm × 118 mm and of different mixing proportions of clay soil to fly ash were moulded. The amount of fly ash was increased in steps of 10% by volume up to 70%. The bricks were dried in shade for a period of six days and then fired in an oven up to a temperature of ~1300˚C. Compressive strength, thermal conductivity and water absorption of the bricks were measured. The brick compressive strength was measured using the compressive strength machine. The brick was first prepared by removing all the unevenness from all the brick faces and the dimensions were also measured. The brick was placed horizontally between the flat plates of the machine. An axially load was applied until brick failure occurs. Then the compressive strength was calculated by dividing the maximum load by the average area of the brick face. The brick thermal conductivity was measured the Hot Wire Method  . The standard water absorption method was used  . A passive solar energy-efficient house was designed and constructed in Somerset East. Ecotect building design software was used to simulate the thermal performance of the house. Material properties were also specified. Cost efficiency decisions were taken in the design and construction of the house. On completing constructing the house monitoring sensors were installed, i.e., thermocouples, HMP50 temperature-humidity probe, model 03001-wind sentry anemometer and vane, and pyranometer were installed. Thermocouples were installed inside and outside the building to measure air and wall temperatures. 26 thermocouples were distributed in the house to map-out the temperature pattern. Six thermocouples were installed to measure surface wall temperatures. Thermocouples to measure indoor and outdoor wall surface temperatures were placed and glued at the center of the walls. A wind anemometer and a vane, temperature-humidity probe, and a LI-COR pyranometer were placed on the top of the roof. A second temperature humidity probe was place in the center of the house at height of about 2 m above the floor. All these sensors were then connected to a RC1000 datalogger, powered by a 12 V battery, which was charged by a 20-watt solar panel. The properties of fly ash bricks depend mainly on two factors: 1) the energy content of the fly ash used and 2) the chemical composition of the fly ash. Table 1 shows the chemical composition of fly ash from two different sites. The X-Ray powder diffraction (XRD) method was used to determine the fly ash chemical composition. Site A was cloth manufacturing company, and site B was a soft drink producing company. The two companies were selected because of the different technology of the boiler system used. The boiler efficiency will then determine the characteristics of the coal ash. The other constituents include FeO, Na2O, K2O and unburnt carbon that form the bulk part of the fly ash. The South African fly ash has high-energy content, which makes it excellent in brick making. The fly ash from site A was used to make the bricks. Chemical composition of the fly ash and the temperature attained during burning determine the brick colour. High-energy content fly ash has a great influence on thermal conductivity. Figure 1 shows the variation of thermal conductivity of bricks for different proportions of fly ash. From Figure 1 it can be observed that thermal conductivity of fly ash bricks generally decreases with increase in the amount of fly ash. The minimum thermal conductivity (0.0564 W/mk) corresponds to a mixing proportion of 50% of fly ash by volume. This means the mixing proportion of 50% fly ash will result in 93% reduction of the thermal conductivity. On burning the bricks, the incompletely burned coal in the brick acts as a fuel to enhance uniform burning of the bricks with a lower level of external energy required while at the same time producing uniform bricks. The end product is very light in weight (density 400 - 1190 kg∙m−3) as the burnt ash leaves small-unconnected cavities that give the bricks effective heat insulating properties (low conductivity). On the other hand, low energy content fly ash mainly influences the water retention properties without much modification to thermal conductivity. Low energy content fly ash can therefore be added to soil to increase its water retention capacity thereby increasing agricultural production. Figure 1. Variation of thermal conductivity and water absorption at 25˚C. Table 1. Chemical composition of fly ash, %. Building Standard (SABS), the brick water absorption must be less than 20% by weight. With reference to Figure 1, the locally made bricks do not meet the minimum requirements, and the addition of fly ash has shown to improve the water absorption of the locally made bricks. The addition of 20% of fly ash by volume reduced the water absorption by 32%, while the addition of 50% fly ash lowered the water absorption by 62%. Since the created cavities are unconnected, it implies that permeability and porosity are reduced. The reduction in permeability and porosity implies the reduction in freezing/thawing damage of the brick, since there will be small amount of water in the brick. Figure 2 illustrates the variation of compressive strength of fly ash bricks for different proportions of fly ash. The compressive strength increases with the amount of fly ash, attaining a maximum compressive strength at 50% fly ash. The SABS specify the minimum brick compressive strength to be 5,000,000 Pa. From Figure 2, it can be seen that the locally made bricks (with no fly ash) do not meet the minimum compressive strength requirement. The addition of fly ash significantly improves the compressive strength of bricks. 7000 fly ash bricks with a mixing proportion of 50% fly ash were made and used to construct a passive solar house. Figure 2. Compressive strength of fly ash bricks. Figure 3. 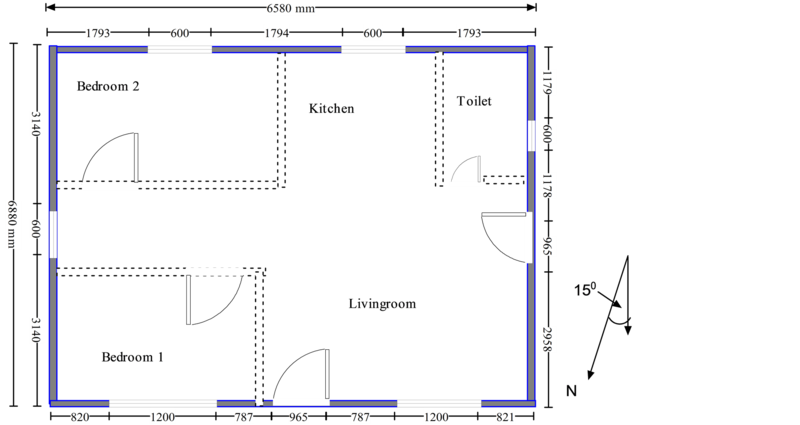 The floor plan of the passive solar house. Figure 4. Completed passive solar energy efficient house. house. The house was made to face N15˚W. This orientation was to optimize the solar radiation that penetrates indoor in winter. The house has two standard doors and a total of six windows, i.e., two large windows on the north (front wall), two medium windows on the south wall, and one small window on the west wall and another small window on the eastern wall. On the north-facing roof there are four clerestory windows. One of the doors is on the north wall and the other on the west wall. An open plan layout was adopted in order to optimize natural ventilation. Mechanical ventilation systems were avoided in order to keep the running cost of the house low. The location of the experiences prevailing westerly winds (W60˚ ± 15˚N), and the placement of a door on the west and a small window on the east wall allows to control the ventilation rate, making it possible to regulate the indoor temperature. The small window on the west serves to capture westerly prevailing winds and this minimizes the indoor moisture condensation. The roof was split into two, the lower and upper roof. The lower roof faces north while the higher roof faces south. This was done in order to enable the insertion of clerestory windows making it possible to direct solar radiation to the desired rear zone (floor and southern wall) and to maximize day lighting, thus minimizing the use of electricity during the day. The northern roof is ideal for mounting photovoltaic modules as active solar energy converters. In summer, the sun almost rises from the east and sets in the west. In this case, the roof overhangs were made long enough (simulation was done ECOTECT) to eliminate the possibility of sunrays penetrating indoor. With reference to the clerestory windows, the upper roof was extended out by 200 mm while the lower roof was extended in by 100 mm. This eliminates the possible direct penetration of the solar radiation in summer while allowing maximum penetration in winter. In winter (May to August) the sun rises almost northeast, but following a low northern path in the sky and then set in the northwest. From May to August the daily maximum angle of the sun ranges from 34˚ to 48˚ and this maximum angle occurs at around 12 h15 with June 21st having the smallest angle. Thus, the north facing windows allows solar radiation to penetrate indoor, while the clerestory windows allow the south wall and the far south floor (thermal mass) to receive solar radiation. The thermal masses of high heat capacity (i.e. concrete floor of 100 mm thickness and the wall made from fly ash bricks) absorb solar radiation during the day. Figure 5 shows how the lower winter sun penetrates indoors and heats the thermal mass. This penetration of solar radiation is prevented in summer by overhangs. The passive solar house was monitored for six days, i.e., March 1st, 2006 to March 6th, 2006. Figure 6 shows the indoor and outdoor temperatures patterns for the period tested. The house was being used as the kitchen, a sitting room and at the same time used as a bedroom. The house was subdivided using cloth. A stove was situated at the west wall close to the door. The indoor temperature follows the outdoor temperature, but with thermal time lag of about 3 hours. The indoor experience a temperature swing of about 11˚C while for the outdoor it was 14˚C. Figure 5. Operation of the passive solar house. Figure 6. Indoor and outdoor temperature. The outdoor attained a maximum temperature of about 33.66˚C while the indoor experienced a higher temperature of about 36.63˚C, however, the indoor experienced a low temperature swing. Figure 6 also shows the lower and upper limits of the thermal comfort zone. The indoor was observed to be within the comfort level for 60% of the total time tested while the outdoor was only 30%. The performance of the house could have been higher if the occupants were operating the house properly, i.e., opening and closing of windows and doors when necessary. For most of the time windows were closed, thus preventing the prevailing winds to cool the house. On March 3rd, 2006 at around 08:30 local time, the outdoor temperature dropped to 9.75˚C but the indoor temperature only dropped to about 18˚C. Surviving this strenuous test shows that the passive solar heating design can be freeze resistant. The ordinary windows were not opened for approximately 60% of the time they were supposed to be opened, this then contributed negatively to the thermal performance of the house. Figure 7 shows the variation of the outdoor and indoor relative humidity. Figure 7. Indoor and outdoor humidity. ~26.09%. The indoor humidity was observed to be within the comfort levels (30% - 60%), for about 75% of the total time tested. For proper operation of the house windows and doors needs to be opened or closed when necessary to allow air circulation and unnecessary heat loss/gain. However windows were closed for most of the time and clerestory windows were never opened, thus minimizing the rate of air exchange. 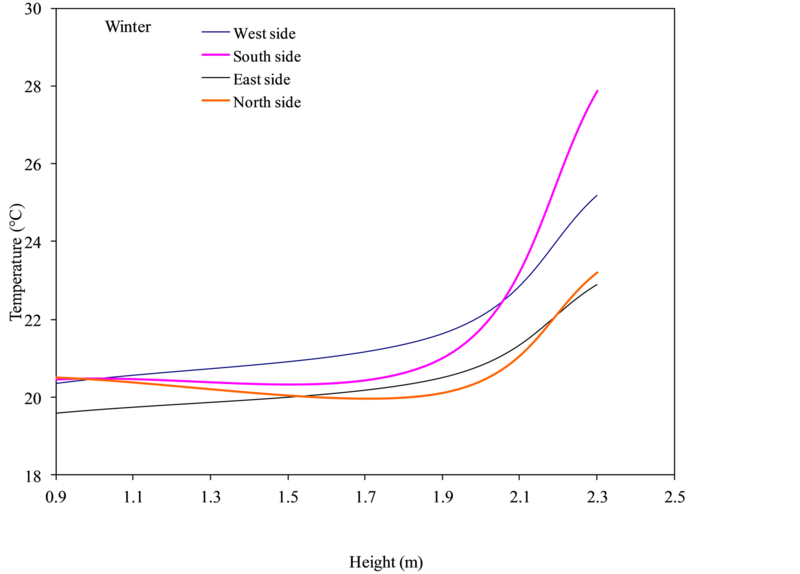 Figure 8 shows the mean indoor vertical temperature variation at three different heights. With reference to Figure 8, it can be observed that there is a systematic variation in temperature within the house that is related to the height above the floor. From Figure 8 it is evident that temperature increases with height during the day. However, at night there was a tendency of uniform temperature distribution. At night the roof (iron corrugated sheets) will be at a lower temperature than the indoor air temperature, and the tendency that warm air raises results in the warm rising air to be cooled by the roof making it to descend again. This results in a more uniform temperature distribution. However, during the day, the roof will be at a higher temperature than the indoor air, so the warm air that rises is trapped closer to the roof, and as the roof temperature continue to increase, the temperature of the air closer to the roof also continue to rise. This therefore creates an almost stagnant vertical temperature gradient. By opening the clerestory windows, the warm air can therefore be exhausted out, thus allowing cooler outdoor air to penetrate indoor. The vertical temperature variation was seen to depend with the side of the building, i.e. north, south, east or west. From a height of 1.9 m to 2.4 m the mean temperature gradient was found to be 2.5˚C/m while from a height of 0.9 m to 1.9 m the mean temperature gradient was found to be 2.1˚C/m. The vertical temperature variation creates a density gradient resulting in vertical air movement (stake effect). 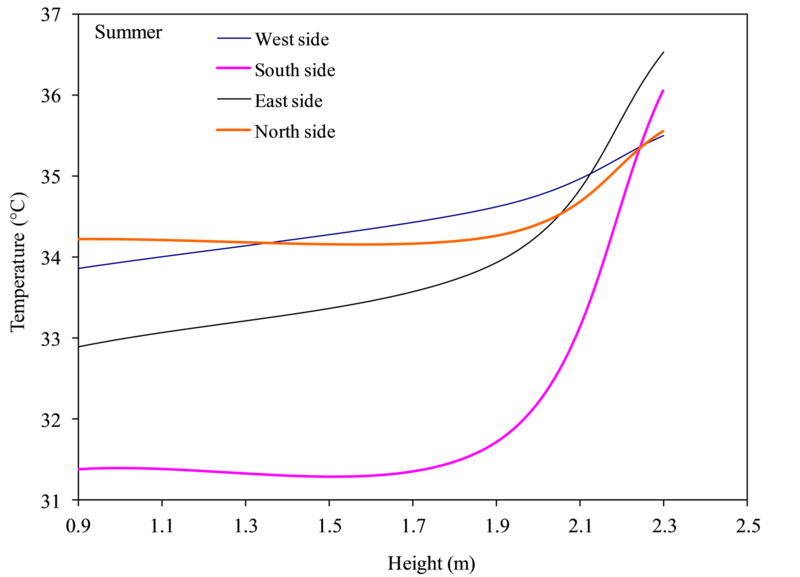 Figure 9 and Figure 10 show the vertical temperature variation at a particular time for summer and winter respectively. From Figure 9 it can seen that the north and west sides are at a relatively higher temperatures than the south and east and this results in horizontal airflows towards the south and the east. From Figure 10 it can be seen that there is minimal horizontal airflows as the air temperatures are almost the same. Figure 8. Vertical temperature variations. Figure 9. Summer: Indoor vertical temperature variation (23/2/2006 15:30). Figure 10. Winter: Indoor vertical temperature variation (5/7/2006 15:30). operating. 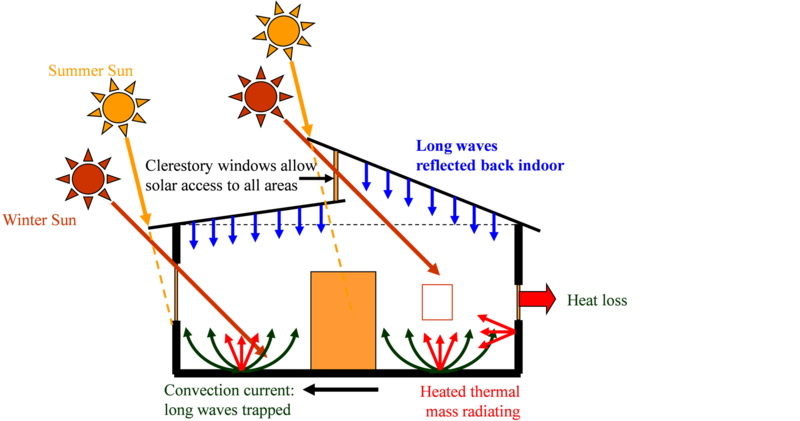 Heating due to solar radiation is time dependent. The mean temperature difference for 1 m height difference was found to be approximately 0.7˚C. This means the roof has a significant influence on the indoor temperature distribution. It can also be noted from Figure 8 that as the indoor environment is heated, there is an increase in the vertical temperature difference. When the indoor cools (due to conduction through the walls and infiltration heat losses) the vertical temperature difference shrinks. It was also observed that the lowest vertical temperature difference occurred during 9 pm to 2 am. Fly ash can significantly improve brick properties. Water absorption and thermal conductivity decrease with the amount of fly ash, and the mixing proportion of 50% fly ash produces a brick with the least thermal conductivity (0.0564 W/mk) and water absorption (8.4%) but with the highest compressive strength ~12 MPa. Outside wall plastering could be avoided as these bricks are smooth and their shape and size are uniform. These properties can lead to construction of low-cost modern houses that have better thermal comfort and reduce the cost of the house. A passive solar house was designed and constructed in Somerset East. The indoor temperature swing was found to be 11˚C while the outdoor was 14˚C. The indoor humidity swing was 44.14% while outdoor was 74.89%. The authors would like to acknowledge Tuskegee University and the USAID for financial support. South Africa Building Manual, 2005. Smith, M.W., et al. 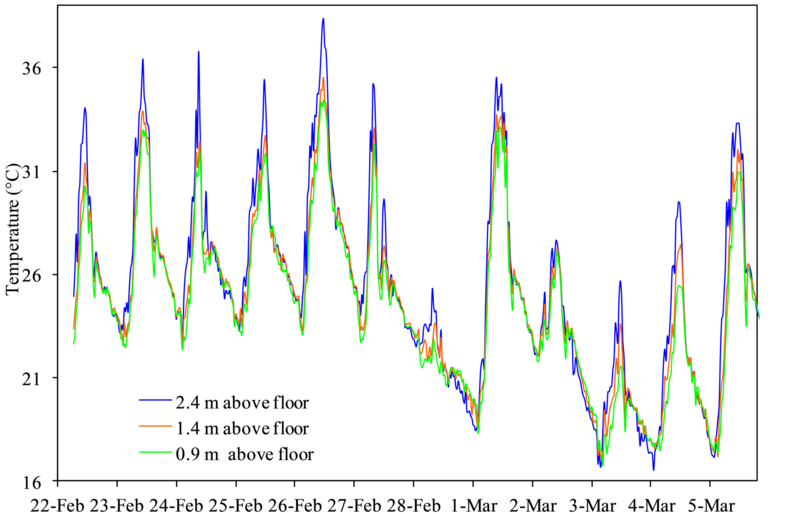 (2001) Thermal Performance Analysis of a High-Mass Residential Building. National Renewable energy Laboratory. Adam, A.A. (2009) Strength and Durability Properties of Alkali Activated Slag and Fly Ash-Based Geopolymer Concrete. Ph.D. Thesis, RMIT University, Melbourne. Pel, L. (1995) Moisture Transport in Porous Building Materials. Ph.D. Thesis, Eindhoven University of Technology, Eindhoven.